1. All five print and laminated versions of our Latin Large Print Altar Cards are on sale for half price. Their framed versions are reduced $25.00. 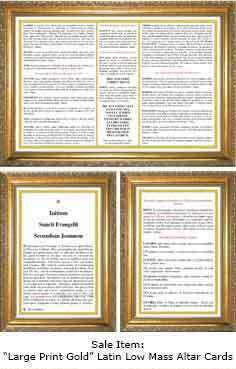 Please see the Latin sub-category Altar Cards Large Print for details. 2. Newly released altar card designs are often sale priced for awhile too. See the Specials sub-category New Releases. 3. Discontinued Items are half price until their stock is depleted and no longer offered for sale. See the Specials sub-category Discontinued Items. 4. Lastly, during the month of August, 2016, shipping is only $1.00 from/to California, US residents. If we at least break even on this promotion, we intend to periodically rotate a variety of states and countries with this special limited offer.